Many events have now been implemented in the AmigaOS host kit for REBOL 3. Double clicking, keyboard events and mouse moves are some examples. These events make the GUI quite functional now. Thanks to a patch from Richard Smolak (aka Cyphre), the REBOL 3 style browser now runs as well. 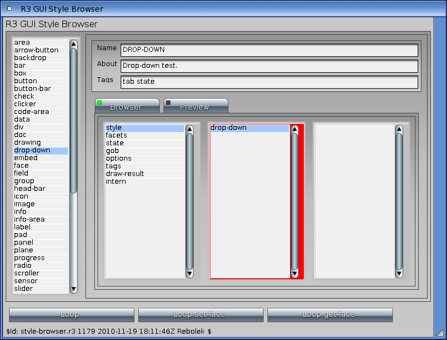 The style browser is used to help test the REBOL GUI.